The basal ganglia comprise a group of structures that regulate the initiation of movements, balance, eye movements, and posture. 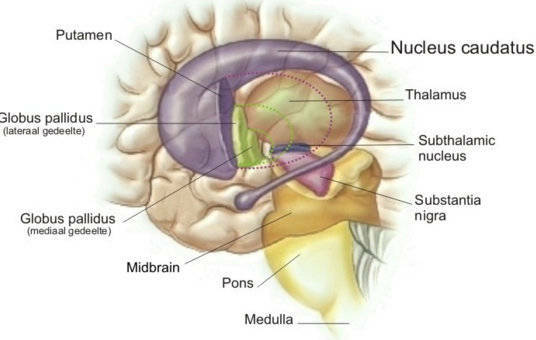 They are strongly connected to other motor areas in the brain and link the thalamus with the motor cortex. The basal ganglia are also involved in cognitive and emotional behaviors and play an important role in reward and reinforcement, addictive behaviors and habit formation. A 2008 study by Das and colleagues that approximately 5% of apparently healthy middle–aged adults have micro–lesions in the basal ganglia. Known clinically as silent cerebral infarcts (SCI), these lesions have an overall prevalence of about 10% in seemingly healthy adults. The basal ganglia are particularly associated with movement disorders such as Parkinson's and Huntington's disease. In terms of cognitive disorders, basal ganglia abnormalities have been found in individuals with schizophrenia, and may explain habit learning deficits associated with the disorder (Keri, 2008). The basal ganglia may also contribute the neuropathology of depression, particularly in relation to the limbic system (Stathis and colleagues, 2007). Damage to the basal ganglia cells may cause problems with one's ability to control speech, movement, and posture. This combination of symptoms is called parkinsonism. A person with basal ganglia dysfunction may have difficulty starting, stopping, or sustaining movement. Depending on which area is affected, there may also be problems with memory and other thought processes. Treatment depends on the cause of the disorder. How well a person does depends on the cause of the dysfunction. Some causes are reversible, while others require lifelong treatment. Call your health care provider if you have any abnormal or involuntary movements, unexplainable falls, or if you or others notice that you are shaky or slow. Jankovic J. Movement disorders. In: Daroff RB, Fenichel GM, Jankovic J, Mazziotta JC, eds.Bradley's Neurology in Clinical Practice. 6th ed. Philadelphia, PA: Elsevier Saunders; 2012:chap 71. Lang AE. 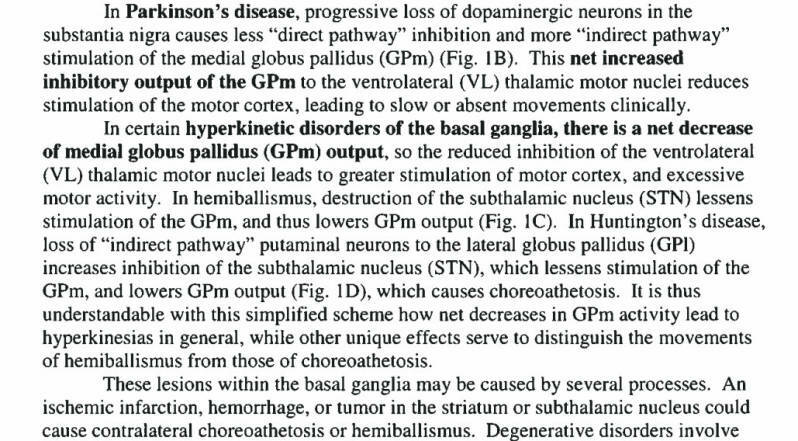 Parkinsonism. In: Goldman L, Schafer AI, eds. Goldman's Cecil Medicine. 24th ed. Philadelphia, PA: Elsevier Saunders; 2011:chap 416. Lang AE. Other movement disorders. In: Goldman L, Schafer AI, eds. Goldman's Cecil Medicine. 24th ed. Philadelphia, PA: Elsevier Saunders; 2011:chap 417. Updated by: Joseph V. Campellone, MD, Department of Neurology, Cooper University Hospital, Camden, NJ. Review provided by VeriMed Healthcare Network. Also reviewed by David Zieve, MD, MHA, Isla Ogilvie, PhD, and the A.D.A.M. Editorial team.